There are many worlds in the universe outside of our own, connected by doors that are hidden to the eye. But if you chance upon those doors, you can be transported to a place where supple beauties reign supreme and all of your fantasies come alive. Should you pass through the doorways, be most careful, for the creatures you will meet can be as dangerous as they are beautiful. Many would die for a glimpse at those worlds Miyuki would do anything to have them go away. Created by CLAMP. Authors of hit titles such as Chobits, Wish, Angelic Layer and Cardcaptor Sakura. Filled with references to other Clamp titles. 96 Black and White pages, 24 Color Pages. I had seen part of the Miyuki-chan anime back in late 2002 or 2003, so I knew that this volume would be filled with scantily-clad women constantly trying to molest Miyuki. I had thought, however, that there would be more plot, and it had been sacrificed by the anime production company for more fan service. After all, CLAMP is well known for often having extremely complex story lines. But no. The only thing complex about this series is CLAMP's signature baroque art style. 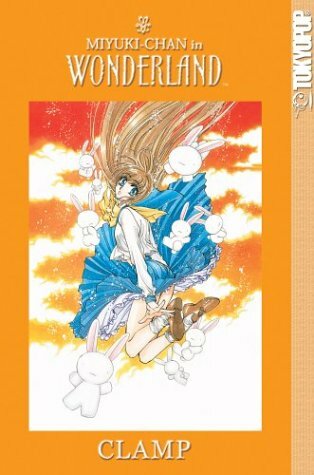 In addition to the famous 'Wonderland' and 'Through the Looking Glass' spoofs that made it into the anime, Miyuki-chan visits several other worlds, including 'Part Time Work World', 'Mahjong World', a fantasy video game, and a couple of others. In each one, she is chased by lingerie-clad women until she wakes up. It's a never ending cycle. The ultimate weirdness is when Miyuki-chan is watching the movie version of X, another CLAMP series, and interacts with those characters, none of whom really act like their normal selves. Her clothes are constantly being torn off. Other women are constantly stripping and/or jumping on her. Miyuki says she doesn't like it, but she doesn't always fight the women off so vigorously, so it's hard to say that's true. It's completely over the top, gratuitous fan service...not at all something you'd expect from the creators of Card Captor Sakura or Angelic Layer. Not being a young teenage boy tormented by lust, Miyuki-chan in Wonderland didn't do anything for me. The art's is right up there with CLAMP's best, but the lack of a plot and ridiculous fan servicing was seriously disappointing. sent to Erica Shmid of Wisc. Rapids, WI to fulfill a request on Paperbackswap.com!